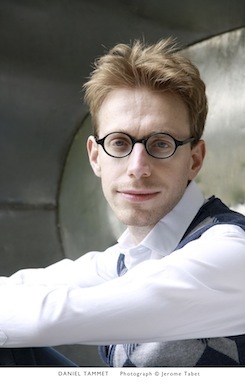 Author of the global bestseller “Born On A Blue Day,” mathematical savant Daniel Tammet is the perfect guide for this engaging, eclectic, deeply personal exploration of all things numerical, and what they can teach us about our lives and minds. In this collection of essays, Tammet discusses a fascinating range of topics – from fingers and fractions, to snowflakes and the streets of New York, with synaesthetic colour, wit, and reflection. His tone is intimate, never professorial, confiding insights and experiences to readers without jargon or condescension. Admirers of Blue Day will be delighted by the poetic sensibility and careful precision with which Tammet returns to his internal world of numbers: the multi-dimensional, coloured and textured landscapes of his mind. But they will discover new facets too in his meditations on identity, the flow of time, beautiful sentences in “The Great Gatsby,” and the confounding nature of his mother-son relationship. Tammet makes maths ever accessible, enjoyable, and relevant, by linking it to the essential questions and experiences of our shared humanity: Why do the years seem to quicken as we get older? Are we alone in the universe? Is there such a thing as an “average” person? Other essays showcase Tammet’s gentle wit, such as when he wonders whether Anne Boleyn counted in elevens (assuming the legend of her having six fingers on one hand were true), and his ability to reminisce movingly on the moments – like his first sighting of falling snow in early childhood – that would go on to inspire his famous passion and extraordinary gift with numbers. Combining a vast and free-ranging curiosity with a native and much-celebrated mathematical creativity, Tammet’s essays speak directly and evocatively to our imagination, endowing fact with all of the poetry and possibility of fiction.
" An interesting and often beautiful approach: Tammet writes well....Tammet’s discussion of big numbers is fascinating. " " What lifts Tammet’s entertaining collection above the ordinary are the often surprising links that he sees, explores and explains." " Thinking in Numbers is unprecedented: a pitch-perfect duet between mathematics and literature. More than that: it is a hybrid. Something new.... These essays are by turns playful and confessional (as when Tammet, the man with the supposedly supercharged brain, singularly fails to predict the simplest actions of his own mother). There are several virtuosic performances. (Noticing that Shakespeare would have been one of the first English schoolchildren to learn about zero, Tammet reinterprets and elucidates some of the poet-playwright's most powerful and moving verse.) ... We do not approach novels, or even poetry, as timorously as we approach mathematics, though Tammet convincingly demonstrates that the three forms are very closely related, with bonds far stronger and more demonstrable than those that supposedly bind maths to music.... Mathematics, Tammet says, is illimitable. It is a language through which the human imagination expresses itself. Presumably this means mathematics has, or deserves, a literature. In Tammet, it already has a laureate"
"Explores the 'what if' of maths and links it with literature and life. He is an exhilarating thinker, an exciting writer, and looks at the world with an eclectic, quizzical eye." " Tammet is an accomplished writer with a prose style akin to a warm embrace, whose first book Born On A Blue Day, about growing up with Asperger syndrome, has sold more than half a million copies and been translated into 20 languages.... In this scintillating collection of 25 essays (I wonder why he did not stop at a more easily divided 24) Tammet enlightens and entertains in (approximately) equal measure.He even argues persuasively that mathematics like literature helps “expand our circle of empathy” and that “numbers, properly considered, make us better people”. Verdict: 5/5 "
" a miscellany of personal anecdotes and how mathematics links to subjects such as history, psychology and literature." "These essays have no resemblance to maths as taught in my state school. They are more art than science, steeped in classical history and charming anecdote. As fluid with words as with numbers, his essays are artfully constructed: intriguing openings to entice us; interesting snippets of history; accessible but unpatronising tones; neat endings. His relationship with digits is synaesthetic: he ascribes characteristics to them more commonly associated with people.The essays are short enough to keep interest stimulated, the topics varied... For those to whom maths is shark-infested water, this delightful volume shows the safety and comfort offered by numbers." "In Tammet’s mind, literature, art and maths are united. For him, maths’ real-life applications are not merely tax returns and restaurant bills, but the storytelling of an infinite subject and the reasoning behind our daily existence." "In these delightful, quirky essays, Tammet shows how "numbers, properly considered, make us better people." "In fact, his appreciation of the connections among mathematics, emotions, literature and the concrete realities of daily life is so nuanced that he can tease profound insights into human relations from the notion of infinity or the concept of nothing." 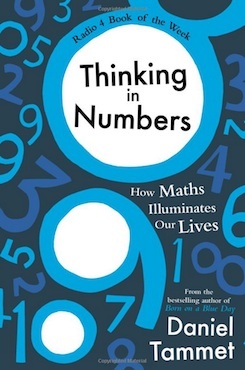 "a fascinating account of how maths illuminates our lives. " "...an attempt to convince readers of the intrinsic beauty of mathematics. " " By his own admission, Tammet’s Asperger’s syndrome meant that numbers – and books – were his only friends when he was younger, and his highly literate enthusiasm shimmers on every page of Thinking in Numbers… One of the most important messages to emerge from this enchanting book is that being on the autism spectrum does not represent an obstacle to imagination… His aim with Thinking in Numbers is to show that mathematics can be as rich, inspiring and human as literature – and to “bruise” the line between fiction and non-fiction… he succeeds magnificently." " An autistic savant shares his insights on mathematics and life in this far-ranging collection of entertaining and thoughtful essays. Tammet’s (Born on a Blue Day) interests are intriguing and stunning in their diversity—one moment he’s considering the existence of extraterrestrial life and breaking down astronomer Frank Drake’s famous equation for calculating the number of intelligent civilizations in the universe; the next, he’s exploring Shakespeare’s fascination with “the presence of absence” and the ways in which nothing can reveal far more than something. The essay “Snowman,” one of the book’s best, is a poetic meditation on snowflakes and what they reveal about complexity. Tammet is a master of gleaning profound insights from seemingly mundane trivia, whether he’s considering the polydactylism of Anne Boleyn, the numberless Kpelle tribe of Liberia, Plato’s insistence that the ideal city be limited to exactly 5040 landholding families, or the mathematics of mortality rates. This is a delightful book, well-suited to random sampling, and capable of bringing even the most numerophobic readers into agreement with Hungarian mathematician Paul Erdos: “I know numbers are beautiful. If they are not beautiful, nothing is.” Tammet’s paean to numbers is proof that Erdos was right." "With these words from a fellow mathematician, “There is nothing as dreamy and poetic, nothing as radical, subversive, and psychedelic, as mathematics,” Tammet describes the magical realms he explores in these 25 wonderful essays... Admirers of Tammet’s Born on a Blue Day (2007) and Embracing the Wide Sky (2009) will find here fresh reasons to laud the author’s gifts. " " Tammet is famous for his unusual brain: he possesses the extraordinary number skills of an autistic savant with very few of the intellectual limitations associated with autism. Because of his gifts, neuroscientists have spent time with him to gain deeper insight into the autistic mind. He is also a best-selling author, and his new book is a collection of beautifully wrought essays about numbers, which he experiences as shapes, colors and textures." "In “Thinking in Numbers,” Tammet elegantly identifies and explores the unseen mathematical concepts underlying historical events, literary works and everyday experiences and emotions." "Tammet, a high-functioning autistic savant, is the author of a best-selling autobiography, “Born on a Blue Day,’’ and he brings to “Thinking in Numbers’’ the memoirist’s handiness with a well-placed detail. In his new book, the details come not from his own life story but from a broad landscape of mathematical, intellectual, and literary history ... the wide reading serves him well." "Against all odds, Tammet has crafted a quirky, thoughtful meditation on how math permeates everyday life ... There are few equations in Thinking in Numbers. Rather, there are short essays exploring how numbers dance and flow through our daily rhythms, from birth to work to play to death. The result is an eclectic peek into a mathematically rich world." " Daniel Tammet loves math — not in an abstract, chilly way but with a sensuous pleasure that he communicates vividly even to people who don’t or can’t share it ... In an essay on mortality tables, Tammet makes the point that nobody is “average,” and that in fact, “the essence of human nature is its endless variety.” His way of looking at the world, quirky though it may be, delightfully broadens the reader’s experience of the everyday." "This, the 34-year-old’s third book, is a whimsical, irresistible tour through the magic of numbers. You won’t find many equations here. Instead, Tammet takes us from Shakespeare’s obsession with the number zero to the patterns of math within chess, to the near-mystical “googolplex,” the largest number ever conceived (except, of course, for “googolplex plus one”) ... What makes him a generous and gifted author, though, is his desire (and ability) to communicate what it feels like to be him. Tammet’s easy prose contrasts with the complexity of his subject, allowing the knottiest of ideas to slip unencumbered into the understanding of even the most math-challenged reader." "It doesn’t take long for the reader to realize that these are essays like Montaigne’s, little meditations, bouncing ideas around and marveling at the connections and variety and sublimity of numbers. One lovely piece highlights the introduction of the idea of nullity into English, called “Shakespeare’s Zero.” Another, called “Shapes of Speech,” demonstrates the unity of mathematics and rhetoric. It starts with Pythagoras and also touches on Aristotle, Euclid, and Abraham Lincoln. It ends, “Friendship is equality.” Clearly, and to his credit, Tammet has a heart as capacious as his intellect." "...a magnificent collection of 25 essays on “the math of life,” celebrating the magic of possibility in all its dimensions.... an absorbing simulation of the synesthetic mind.. The rest of the essays in Thinking In Numbers, ranging from fascinating biographical anecdotes to speculative fiction imagining young Shakespeare’s first arithmetic lessons in zero, are equal parts mind-bending and soul-stirring, and altogether delightful in innumerable ways ." "...he has a rare ability to describe what he sees in his head.... worth reading if only for the suspenseful description of an extraordinary man in a room, conveying to a rapt audience his pure love of one very special string of digits as it stretches to infinity and beyond. " "I've just finished 'Thinking in Numbers', one of those wonderful books that explode in your head like a supernova. ...Tammet is like a Martian on earth, he brings a marvellous sensitivity, curiosity and empathy to bear on the infinite ways in which we humans see the world…Tammet writes with beautiful and unforgettable prose." Romanian rights in Nicholas Best’s The Greatest Day in History: 11 November 1918. Chinese rights in Julia Boyd’s Travellers in the Third Reich. Japanese rights in Danny Orbach’s Curse on this Country. Hungarian rights in Damiel Tammet’s Born on a Blue Day and Thinking in Numbers. Chinese rights in Lawrence James’s Churchill and Empire and Empires in the Sun: The Struggle for the Mastery of Africa, 1830-1980. US rights in Desmond Seward’s Henry V.
Polish rights in Daniel Tammet’s Thinking in Numbers.